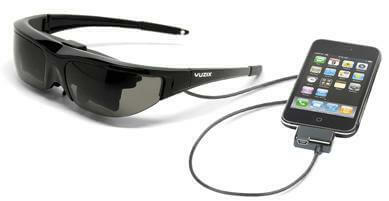 Could the Vuzix be the first HMD to gain market-wide popularity? In the gaming and entertainment industries, head mounted displays (HMDs) are something of a widow-maker. “A TV screen fit on your glasses!” It always sounds like such a wonderfully cool idea, but time and again such accessories have flopped on the market. Does anyone remember Nintendo’s Virtual Boy – definitely an epic failure. Yet with the improvements in LCD technology, and an expanding set of portable video devices, companies are continuing to explore HMDs. If there’s one piece of video eyewear that’s ahead of the curve, it’s Vuzix’s Wrap 920. Weighing only three ounces, the Wrap 920 looks like a pair of dorky sunglasses but it contains two 640×480 LCD displays that create the experience of watching a 67 inch screen from ten feet away. Vuzix seems dedicated to learning from the errors of the past: the battery life is long (6+ hours off of two AAs), the earphones are high quality, there are separate adjustable focii for each eye (to avoid nausea), and it works with every format and device they could get their hands on (2D, 3D, PC, desktops, laptops, DVD players, iPod, iPhone, etc). Just plug the glasses into your favorite video device and you’re in your own private big-screen theater. Is it worth the $350 price tag? Not sure, but it’s probably the best such retail HMD on the market. We’ve seen the Wrap 920 in action before, it can be worn with an iWear camera to create inexpensive and cool augmented reality goggles. There are even more accessories for the 920: VGA converter, light shields, customizable lenses, and head tracking hardware. That last piece could really help Vuzix find a niche in the gaming market. Still, like so many other HMD before it, the Wrap 920 faces a huge hurdle: it’s seen as just a novelty. Watching a “virtual 67 inch screen” sounds cool, and it undoubtedly is, but it’s not something I need to do every day. TV, video games, movies on airplanes…these would certainly be arenas where the Wrap 920 could be applied…but why should we? Are they so mind-blowingly better than looking at the tiny screen of a iPhone? Not really. Yet I have some hope for Vuzix and the Wrap 920: augmented reality. AR is still in its infancy, but it has the potential to radically change the way we interact with media. Unlike with traditional video, AR directly benefits from having tracked, personalized displays. If AR becomes widely popular, and I think it may, HMDs will shift from novelty to perceived necessity. As that happens the Wrap 920, or its successors, may be the first examples of video eyewear that actually succeed.